I’m not sure I’ve ever used this blog to direct a potentially interested audience to something they might want to buy, but I think this is something that warrants mention. 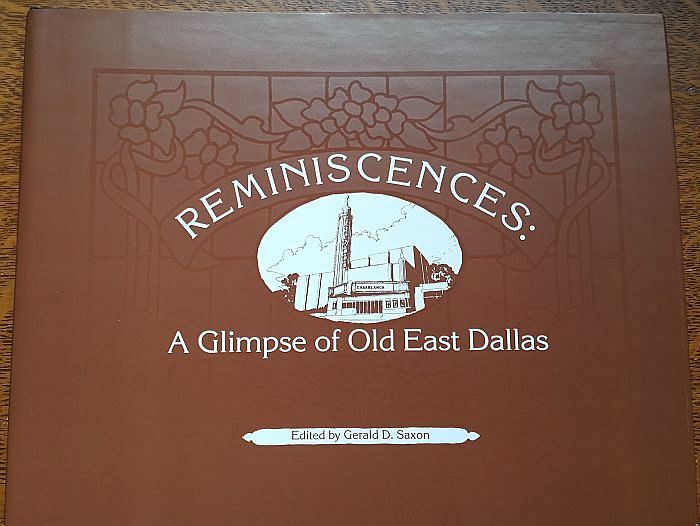 I encourage interested parties to track down a copy of the wonderful book Reminiscences: A Glimpse of Old East Dallas, edited by Gerald D. Saxon and published in 1983 by the Dallas Public Library. It contains over 150 historic photos of East Dallas and environs (most of which I’d never seen before) and more than 20 oral histories of the area from older folks who grew up or lived in Lakewood, Munger Place, Junius Heights, and other Old East Dallas neighborhoods (the oral histories are from the Lakewood Community Library Oral History Collection, which one may listen to at the downtown library or at the Lakewood Branch). The photo of Swiss Avenue at the top (with a closer-than-I-always-think downtown in the distance) is one of the great photos in the book. 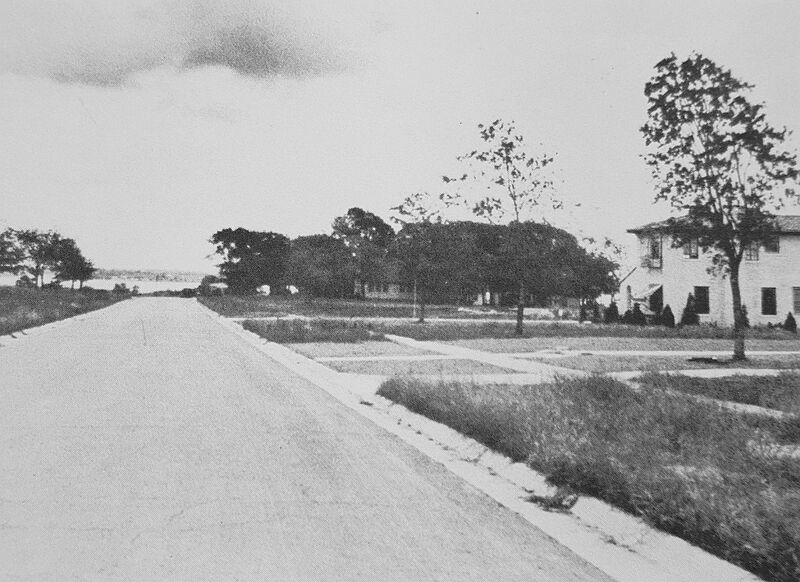 Another is the one below, the caption of which reads: “The 7100 block of Lakewood Boulevard in 1932 looking east to White Rock Lake. (Courtesy of Dines and Kraft, Builders-Developers. )” It’s weird seeing the lake at the end of the street. To see what it looks like today, click here. And this photo — taken around 1938 — is one of my favorites. It shows the Lakewood Shopping Center, with the old Lakewood Library just right of center. 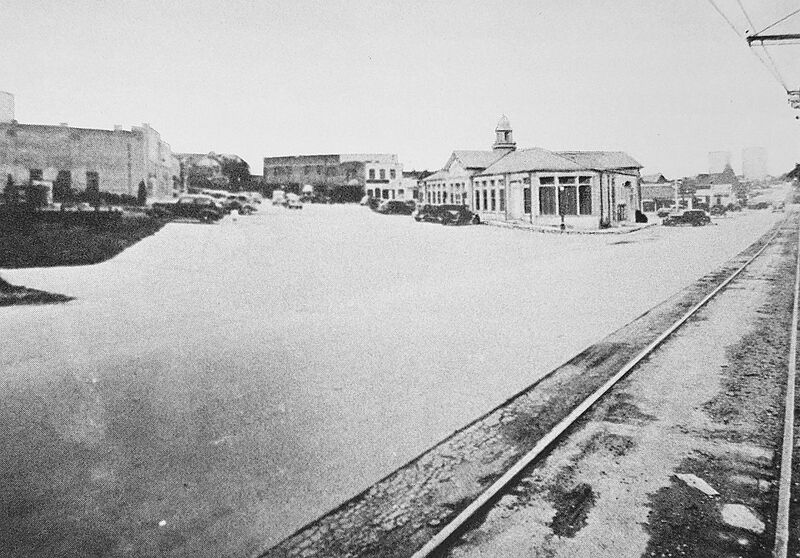 The Junius streetcar tracks are at the right. The empty space at the left is where the Lakewood Theater will be built. 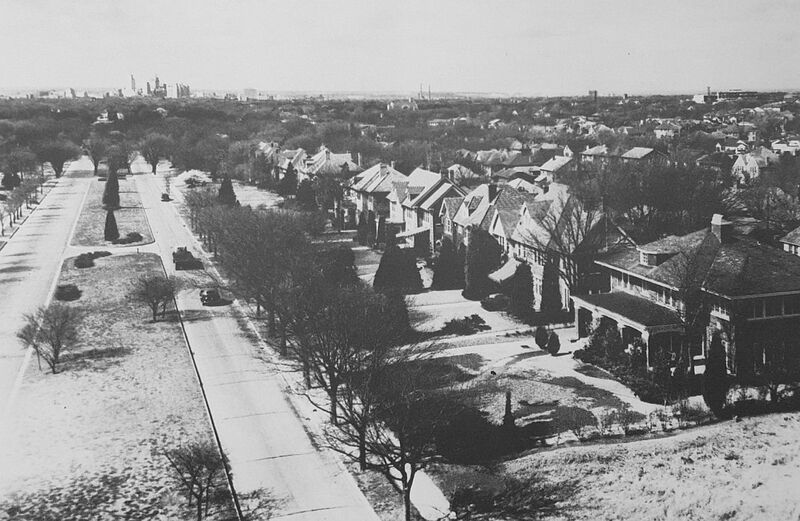 All black and white photos are from the book; top photo is from the collection of the Dallas Public Library (“Bird’s-eye-view of Swiss Avenue,” DPL Call Number PA81-00043). The color has been adjusted. I love this book, but my only complaint is that the text and photos are printed in sepia-colored ink. Just saw the drawing and read the amusing story. In the photo with the library, it looks like the tracks are on or next to Abrams. On the horizon, to the left of the tracks, are two things that look like tall buildings. What are they? I see there was a cupola on top of the library. I wonder if it was there when I frequented the place in the 1960s. The two shadowy-looking things in the distance are two large water towers.